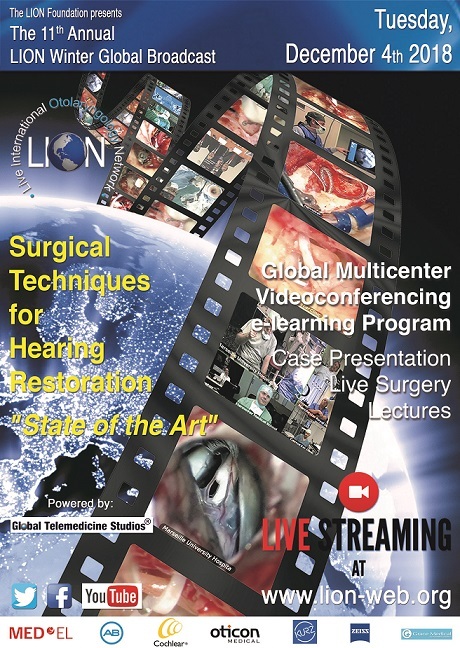 Mark your calendar for the 11th Annual LION December Broadcast Tuesday December 4th 2018: “Surgical Techniques for Hearing Restoration”. Download the final program here. The live surgical program will include all topics in hearing restoration for deafness related to middle and inner ear disease. More detailed program will come soon. Follow live the broadcast at www.lion-web.org. Come and join us with the upcoming Live Surgery Broadcast on December 4th 2018 brought to you by the LION Foundation and made possible due to our kind sponsors. You can follow the live surgery through any connected device that you use to watch video with (Computer, Ipad, Tablet, Android phone or Apple phone etc. You do need to enable Flash in your (Chrome, Safari or similar) browser. We transmit in HD sso for that reason it is advised to use a broadband internet connection to watch. You can ask questions to the moderators present in the Global Telemedicine Studios via chatroom.